Decorative concrete is a popular choice among homeowners who want to add a functional, yet aesthetic, element to their landscaping. Concrete is a versatile, durable and affordable material. When homeowners choose to “dress up” their concrete, decorative concrete offers an unlimited amount of customizing options to create a final product that is truly unique. We offer our clients an array of stamped textures and patterns that resemble the look of natural materials. A few months ago, we wrapped up a full service landscape design and installation project that included decorative concrete. 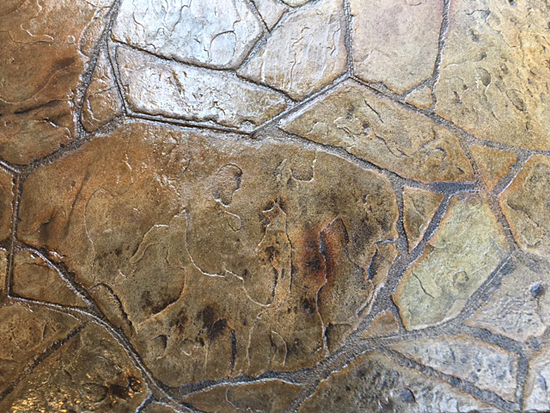 Our client chose a stamped pattern called ‘Arizona flagstone.’ Despite the risk of cracking, decorative concrete is an attractive alternative to natural flagstone because of its long-term durability and savings in cost. Forms have been placed, concrete has been poured and is ready for the stamping process to begin. 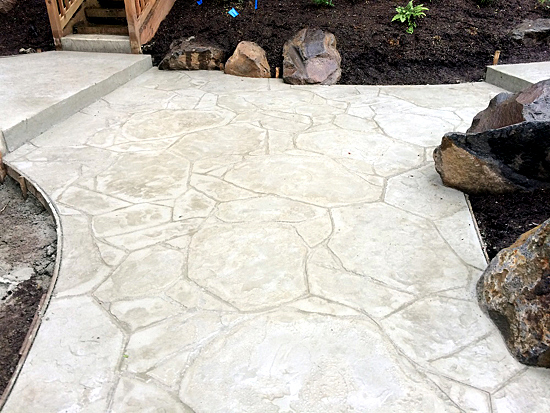 This decorative concrete patio, pathway and step connects the gravel driveway with various parts of our client’s property. Whether he needs access to his shed or staircase leading to the top floor of his home, the concrete provides easy access. This is what the concrete looks like after stamping has occurred. The Arizona flagstone stamp offers the look of flagstone with varying sizes and shapes, and also the texture. There are high and low points with stamped concrete. Antique coloring (the darker color in the photo above) adds depth and contrast to the appearance of the concrete by settling into the low points. The accent color selected is the lighter beige color you see here. A few weeks after the concrete was poured and finished, we applied a sealant. 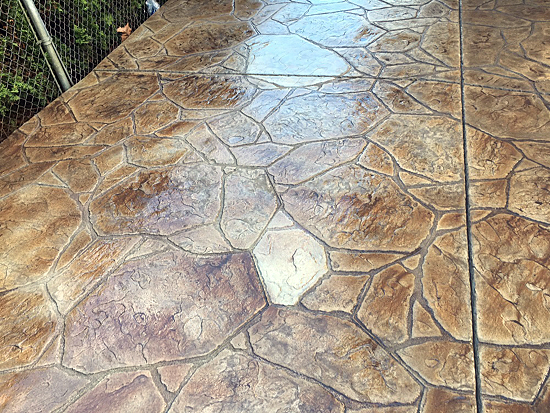 The sealant enhances the color and protects the concrete from surface damage, corrosion and staining, which will improve its overall performance and appearance. 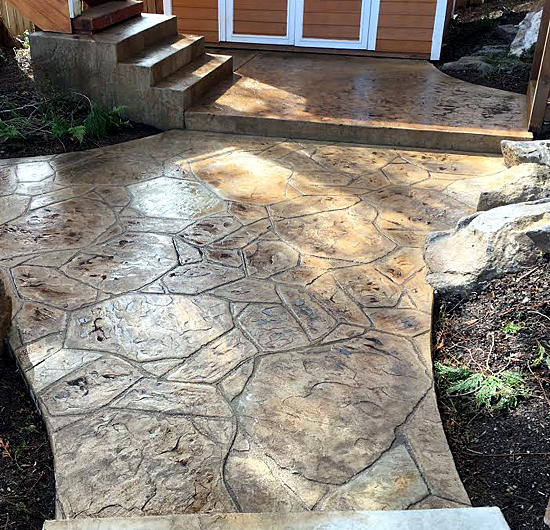 Interested in decorative concrete for your home? Give us a call at 360-697-3215 or email us at info@northwestcl.com for a free estimate. We look forward to hearing from you! Thanks for reading our blog. 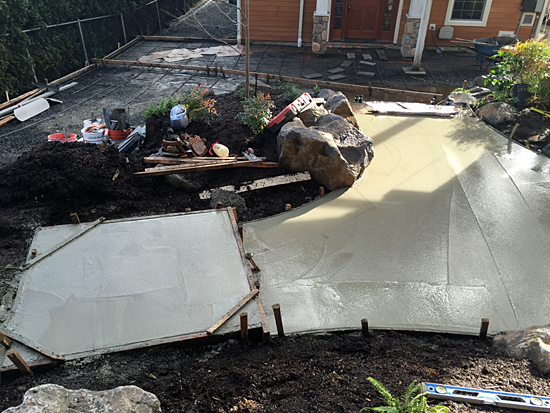 Northwest Construction & Landscape, LLC is a Kitsap County landscaping company that offers landscaping, decorative concrete and lawn maintenance services to homes and businesses across Kitsap and Pierce counties. Subscribe to our monthly newsletter here.